Available for download, Slate Digital VMR 2.0 is a plug-in that represents a virtual mix rack full of modules useful for mixing audio for music and post production. The VMR 2.0 offers an environment somewhat similar to an analog mixing rack, where various pieces of hardware gear such as equalizers and compressors can be chained together to shape your sound. 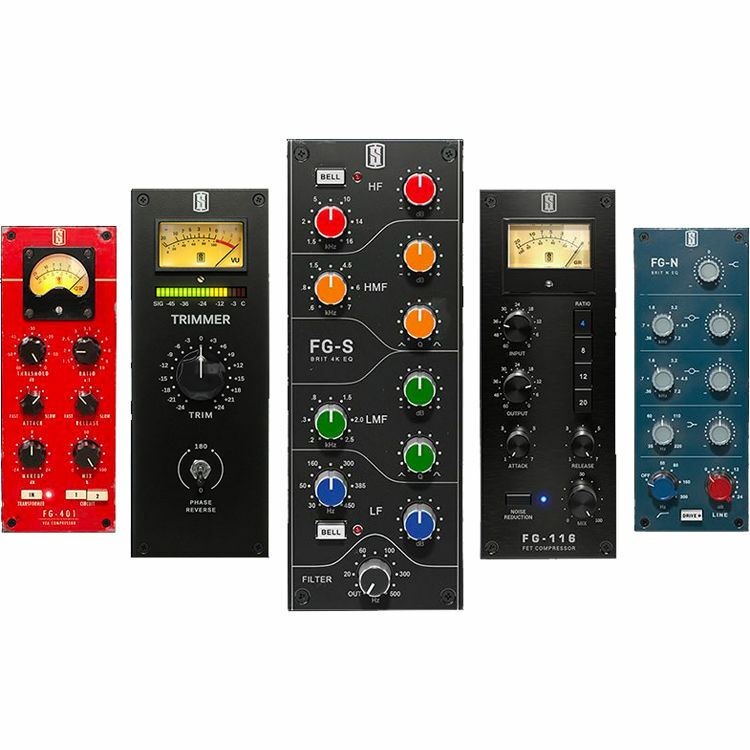 The VMR 2.0 comes stocked with various compressors, equalizers, and utility modules, such as the FG-401, the FG-S, FG-N, FG-116, and Trimmer. Many modules, such as the FG-A, FG-Stress, FG-AIR and more, can be purchased separately and loaded within the GUI. Others, such as The Monster and Revival, are freely available. This is the second iteration of the Slate Digital VMR, and it provides several optimizations over the original plug-in. For instance, you can customize and recall eight Dream Strip presets with the click of a button. Undo and Redo functions have been implemented, and many of the stock modules have been recoded to offer less noise in use (the noise was originally intended to model analog units more faithfully, but Slate has curtailed this analog noise as many users prefer a cleaner operation with the ability to introduce noise if needed). A clear rack button is now on hand, and oversampling can be introduced through the settings menu. VMR 2.0 is compatible with Mac and Windows platforms. It can operate in AU, VST, and AAX formats. iLok 2 or 3 is required to run the VMR 2.0. Note: This software requires an iLok 2 or 3 to run. iLok is available separately. VMR 2.0 opens with a custom channel strip by default. Whenever VMR 2.0 is launched, the leftmost Dream Strip always loads first. Now you can instantly start mixing with the modules you use the most. VMR 2.0 comes with seven default Dream Strips, although you can remove them and make your own. The FG-401 started as a recreation of the classic British console channel compressor but morphed into something else. With a variable attack and release, it also includes an input transformer stage, modeled on the transformer from a British Class-A Console. This adds warmth and sheen to the compressor. There's also a switchable opto circuit path that offers a smoother, richer tone. The FG-S is a digital recreation of a famous British console equalizer from the 1980s. This equalizer offers rich harmonics as well as interactive mid-bands with a fat musical tone. It's considered a workhorse mix EQ that can be used on any kind of track, great for surgical or musical applications alike. The FG-N is a digital recreation of a classic discrete Class-A British equalizer from the 1970s. All aspects of the circuit were modeled, including the rich harmonics and saturation that naturally occur when the equalizer is in use. The original hardware only contained one mid-band, but Slate Digital added another to make the FG-N more versatile. This equalizer is lush and fat. The FG-116 is a precise replication of a classic 76-style American FET limiter. From its trademark timing characteristics to the musical sound of its transformer, the FG-116 gives engineers and producers the musical and fat tone that has made the hardware so famous. The FG-116 sounds great on everything from lead vocals and drums to bass guitars. Trimmer is a useful module that performs a few basic but essential operations within the Virtual Mix Rack: RMS and peak level monitoring, a simple trim control and a phase reverse switch. When using it in the first slot, the Trimmer allows you to define how the signal will hit the following VMR module. Revival is not an emulation, but a simple tonal processor with much going on under the hood. It provides two controls: Thickness and Shimmer. Very little of each is needed to make a track sing through the mix. This module is offered for free. Monster emulates the classic all-buttons-in extreme compression sound of the vintage FET limiter hardware. If you're wondering where the all-buttons-in effect is on your FG-116, look no farther; it's right here, in this freely available plug-in. The all-buttons-in effect can be pretty extreme, so Slate Digital added a few additional features that make this processor more versatile, including a variable high-pass feature, a high-frequency detecter, a punch button, and a mix knob for parallel processing.